I’ve survived week one of NaNoWrio! I’m at about 11,500 words at the moment which means that I’m a little bit behind for the day. Silly work, it just keeps getting in the way! But 11,500 words! I was going to say that I haven’t written anything that long that wasn’t for school, but then I remembered that’s not true! In sixth grade I started writing my own very Brian Jacques-esque (fan fiction?) novel about Lupe the otter. I had binders full of research, you guys! (Not binders full of women, sorry Mittens. I know enough smart and qualified women I don’t have to have other people scout them out for me. Burn!) Maybe my NaNoWriMo project this year should have been to finish Lupe. Perhaps someday. 1. I like words like “probably,” “really,” “something,” “very,” and other vaguely modifying description words. It is probably, really very annoying. 2. I think my novel is The Grapes of Wrath, because I keep interspersing these weird, from the outside chapters that make me think I’m trying to capture the gravitas of the chapter in TGoWwhen the oranges spill on the road and then company (government? I don’t remember) sprays kerosene on them so the Okies can’t eat them. Heartbreaking. I’m sure my chapter where a sparrow looks down at the world and contemplates the zombies will have that same emotional punch in the gut. 3. Writing 1,666 words a day when you have a full time job and are trying to run 15-20 miles a week and talk to your lovely boyfriend and your awesome friends is incredibly hard. I play a lot of catch up. 4. I also fear I may have created a Manic Pixie Dream Girl. Fun side story: I wrote about MPDGs in a grad school assignment. Also in grad school, I wrote a whole paper about wanting to emulate the leadership style of Boudica, which is probably why I will/should never be a library director someday. 5. This may be the worst book ever written. 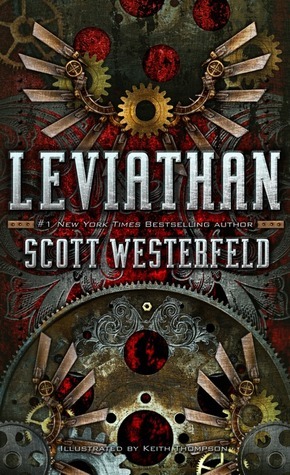 Currently reading Leviathan by Scott Westerfeld – a review powered by gears and steam to come soon. Ah Lupe! Maybe someday it will get finished! So much awesomeness in this post. My sister is doing NaNoWriMo and I had to bow out from too many time constraints already. She says her characters glare at one another constantly. I would be interested in seeing what my novel writing weakness would be. Another year. I read Westerfield’s Uglies and reallly liked it. I will have to try to find a moment to read this one too. Have you read the newest JK Rowling? I haven’t, interested to know what you would think. Thanks, Beth! Yeah, I’m totally behind but I realized (ok, Josh reminded me) that if I don’t finish by the end of the month it’s not the end of the world. I can finish as soon as I can. But even if I take more than a month, I still reserve the right for it to be absolutely terrible. Good for you! NaNoWriMo is on my list of things to do before I’m 30, but I just didn’t have my act together this year. Looking forward to hearing more about your experience so I can plan better for next year! Don’t give up. You can do it! You WILL do it. I have faith in you (and I don’t even know you, so I don’t even know what that means!) Still, just that you’ve done it so far, and you are so close…good luck with that last little bit. That just ROCKS.